The crème de la crème of luxury real estate continues to sell like hotcakes. Homes and condos at the top 10% of the entire market show higher sales this year than last. Mike Pappas, CEO of the Keyes Co., said about 2,000 houses are on the million-dollar-plus market. The homes average 150 days on the market from listing to signing a contract, with a median price of $1.8 million. 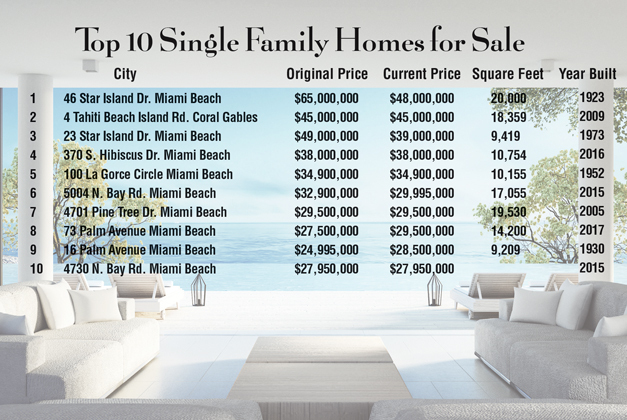 The most popular neighborhoods with waterfront views include Coconut Grove, Cocoplum, and Miami Beach. These neighborhoods see 110 to 120 properties sold per month. The boom in inventory shows developers meeting a demand for luxury high-rise living, with the market now listing 3,166 condominiums compared to 2,800 last year. The 30-month supply means about 100 condos are sold ever month, with each one lasting 50 days longer on the marketplace than single-family homes. Fisher Island, South Beach, Surfside and neighboring Bal Harbour remain popular choices among luxury buyers. Brokers Jill Eber and Jill Hertzberg, or the Jills, of Coldwell Banker see modern, ready-to-move-in homes growing in demand. Houses built in 2004 and, more recently, in 2015 to the present are the most in demand, according to Madeleine Romanello, Compass associate broker. He said brokers rely more than ever on marketing tools to distinguish listings. Video and images captured by drones and photographers are critical for online portfolios. Condo developers are taking advantage of interior designers and designer brand furniture packages accommodating ready-to-move-in buyers. Realtors see a surge from certain international markets. A top producer for Brown Harris Stevens Miami, Josie Wang, says South Americans, such as Brazilians, and Canadians continue to flock to Miami. Elections in Mexico and Turkey motivate some natives to take leave, and despite the political turmoil as well as tanking economy Ms. Wang often sees Venezuelans moving to town. But domestic buyers from California and the Northeast are outpacing foreigners. And realtors say there is always room for negotiation. For example, Ms. Hertzberg says that this year the Jills sold high-end properties from $17 million to $20 million, with 15% selling lower than the original asking price.